Facebook offers six types of Facebook Pages so that you can choose the one that best fits with your product, service, brand, or business marketing needs. When you go to www.facebook.com/pages/create.php, you see the business Page options. Local Business or Place: This Page type is for bricks-and-mortar businesses. Choose this type only if you truly have a local, open-to-the-public type of business. When you click the Local Business or Place option, you see a drop-down menu with 39 category choices. You can choose one of these categories to create a Page, or if none of the categories fits your business, you can choose the Local Business category and go from there. The Info Profile for this type of business Page is very detailed, with editing fields for hours of operation, parking options, and price ranges. Company, Organization, or Institution: This Page type is for a company that isn’t necessarily open to the public the way a local business would be. Many of the categories in the drop-down menu are the same as those for the Local Business or Place type, but the resulting Info Page won’t have the same detailed interface to fill in for prices, parking, and so on. If you have multiple stores in the same city, you need to sit down and decide on a company policy about Facebook Pages. Do you or your store managers want to manage one Page or a Page for each store? Starbucks runs one company Page, for example; Aveda has a custom link that helps you find a local store. Obviously, these are large corporations, but other companies give managers the option to open a Page as long as they adhere to company social media policies. Brand or Product: If you sell an actual physical product, this is the Page type to consider. 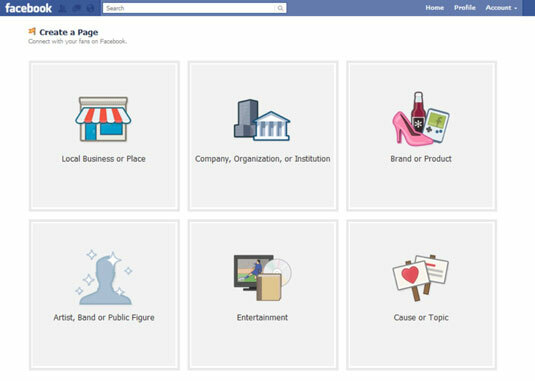 Facebook offers many categories: cars, clothing, computers, pet supplies, and a generic product/service category. Artist, Band or Public Figure: Obviously, if you’re a band or artist, this type is the one to choose, but this Page type also includes politicians, businesspeople, chefs, dancers, and actors. You may think that the actor category would be in Entertainment, but it isn’t! It is under the Artist, Band or Public Figure type. Notice that you use this type for your band, but if you’re only promoting your CD on Facebook, you can use the Entertainment type with the category Album. Just keep in mind that you must be the official, recognized, and authorized representative of whatever type and category of Page you create on Facebook. Entertainment: If you have a TV show or a magazine, or are creating a Page just for your music CD, select this Page type. There are close to 30 different categories listed here. We’re still trying to figure out why Library is listed as a category under Entertainment. Is your library entertaining? Cause or Community: If you’ve been on Facebook for a while, don’t confuse this type of Page with the Causes application. If you’re new to Facebook and are creating a Page for a nonprofit or community organization, don’t select this Page type! Select Company, Organization, or Institution, and select the category of Non-Profit. Every Page type has an Info section. Also, many categories have specific fields in that Info section that are used when someone shares your Page with his or her Friends. Anyone can share your Page by using a Share link located after clicking the gear icon in the top-right corner of the Page. Most Page categories use the Company Overview text to populate the Share invitation. Clicking that Share link autopopulates a post that goes on your personal account Timeline and is visible in the News Feed. Because you’re the Admin of the Page, you also have the option to use the Invite Your Friends function. This particular function is available only to Admins of the Page. Everyone else can only use the Share This Page option. You can share to your own Timeline, someone else’s Timeline, to a group, or in a private message. You can add personal text with a share post but not with an Invite Your Friends function. You can adjust the Page type and category setting later, if you need to.